Children sort the square cards under each category header. There are 6 square cards for each category. 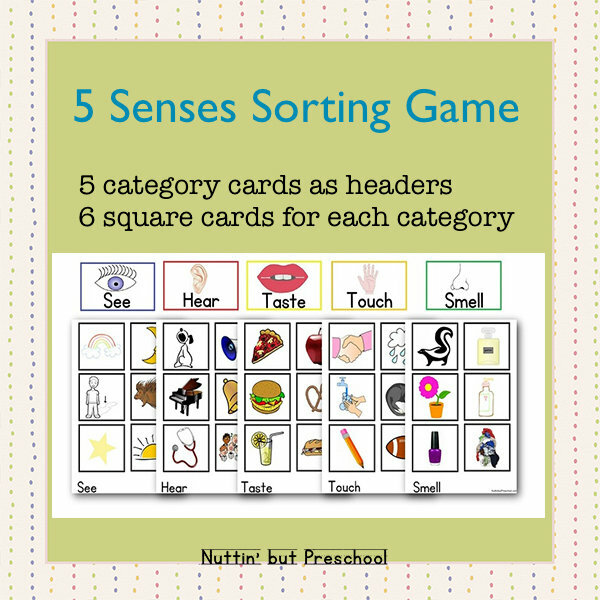 5 senses sorting game is available for a small, reasonable fee of $1.75 by Paypal. 1.) Print all five pages. 3.) Cut apart the cards. 4.) Store the cards in a zip top bag. 1.) Place the 5 category cards (Hear, Smell, Touch, Taste, See) as headers. 2.) Sort the square cards under each category header. There are 6 square cards for each category.